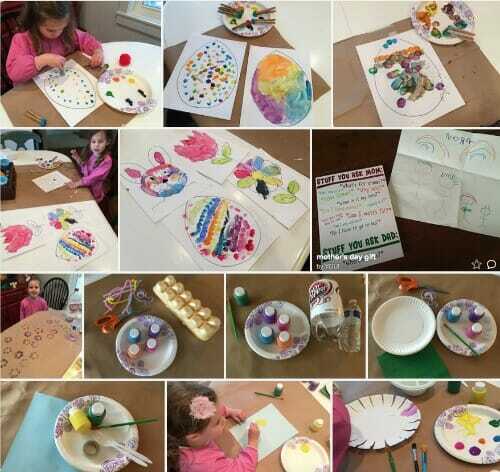 If you’re looking for a few ways to USE UP your child’s or grandchild’s artwork, I hope some of our ideas work for you too! 1. Take a picture and toss the actual art. If you have a good system for taking, sorting, organizing, and managing your digital photos, this might be the fastest, simplest, and easiest method to quickly reduce the amount of paper in your home. Right now, I have a flickr photo album for “Nora’s artwork” and I just created an album for “Simon’s artwork”. I don’t remember all the time, but MOST of the time, I quickly snap a photo of them with their art work, painting, drawing, picture, craft project, etc. and put it into this album. Then, when I make their yearly photo albums, I include several pictures of them with their artwork. 2. Mail or give it to others. 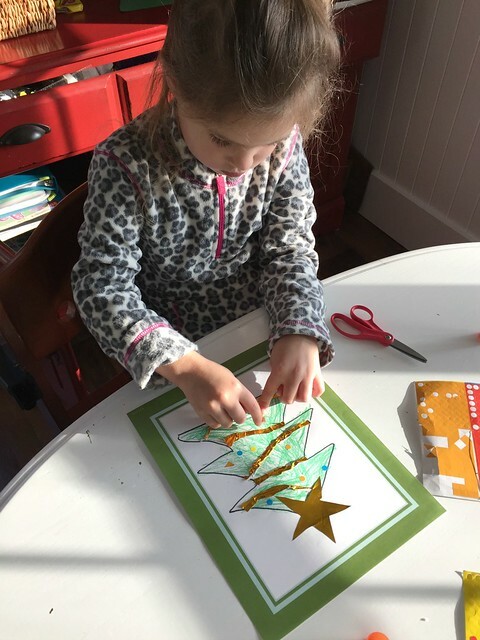 Nora LOVES giving gifts to others, so every week, we mail (or give) some of her artwork to someone — grandparents, cousins, aunts, uncles, a friend who went off to college, neighbors, elderly people from church, teachers, etc. 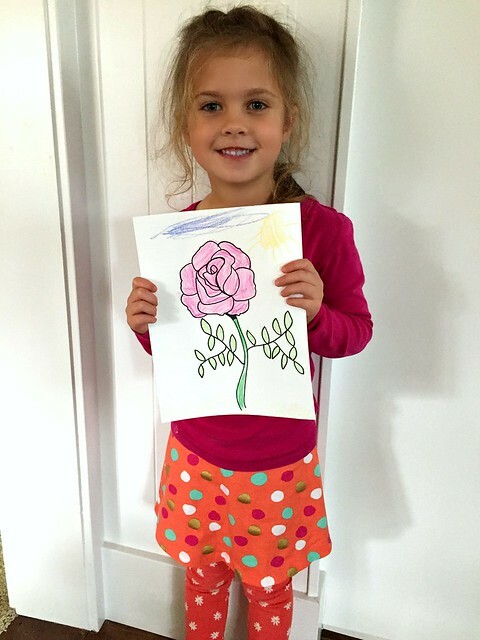 I often write a note to go along with the picture (especially if it’s someone we don’t know that well) explaining how Nora loves to color and draw and that we like to send out her artwork to bless others. I cannot tell you how many phone calls, emails, and return cards we’ve gotten thanking Nora for her “beautiful artwork” and thoughtfulness. The older folks and shut-ins at church especially love getting her pictures… and Nora thinks it’s so great to give her things away. I even ordered her 2 sets of the free return address labels from Shutterfly and have them wrapped up as one of her Christmas gifts (along with her own stationery). 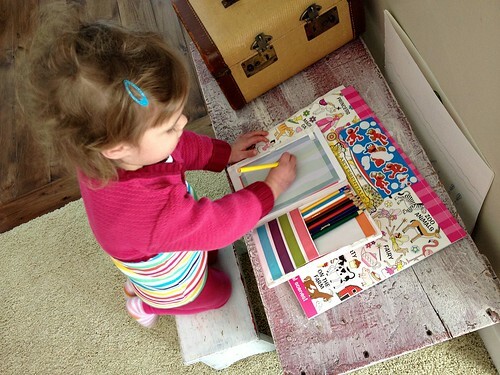 This way, she can use her own paper and envelopes for mailing future cards! 3. 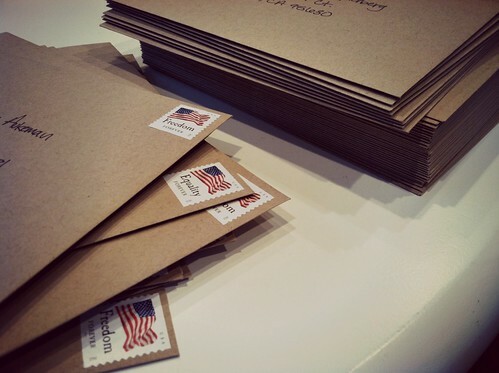 Make envelopes and stationery. Speaking of stationery… we often use actual artwork to fold up and make into our own envelopes and stationery. 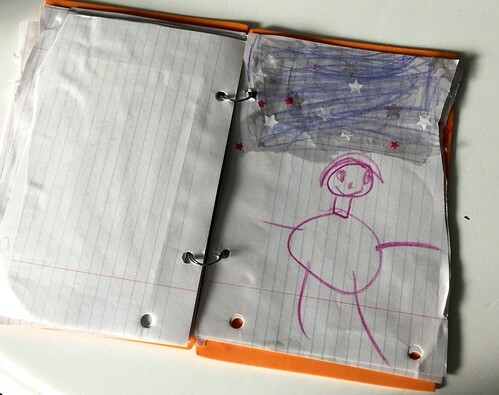 We’ll write notes on the back of a drawing (I’ll write it in pencil and Nora will trace it in marker) and then we’ll fold up another piece of artwork to make an envelope. This means we use up TWO papers in one swoop! We usually don’t put these envelopes in the US mail, but we use them when giving things to people at church, grandparents, or neighbors. We also use fun craft scissors to cut various finger paintings into gift tags. 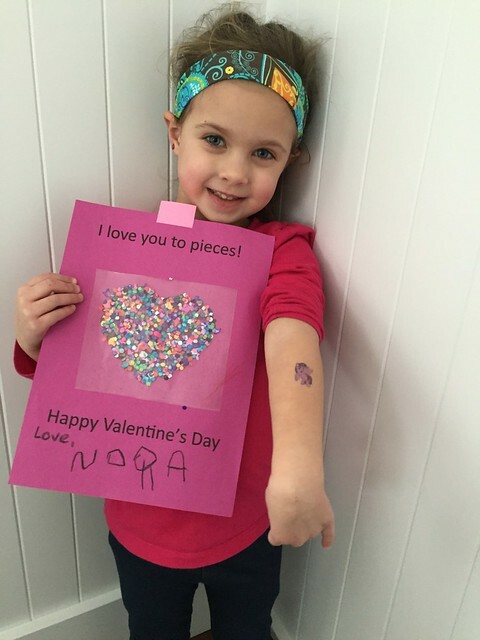 Nora loves to “practice cutting” especially if she can use fun scissors, so this is always a great way to use up some artwork! We make countdown chains for birthdays, holidays, vacations, the start of something special, someone coming to visit, or just because… and we often use recycled artwork to make the links for the chains. We use a small craft paper cutter (similar to this one) and Nora knows how to use it to cut small strips of paper for our chains. 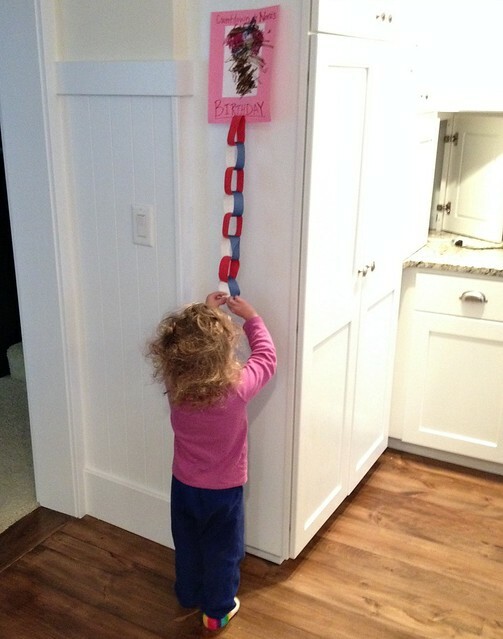 Both Simon and Nora can usually manage to glue the links together on their own — and then we slowly toss the artwork little by little as they tear the link each morning. They don’t realize they’re throwing away their own artwork because they are so excited about removing another link. 5. Make wrapping paper or gift tags. We have 2 big rolls of white craft paper and we regularly roll it out on the floor and let the kids color to their heart’s content. Then we roll it back up until the next time. As we need wrapping paper throughout the year, we’ll cut off a couple feet of our roll and use the kid’s hand-made drawings as wrapping paper (mainly for grandparents, teachers, or the kids’ friends). And as I mentioned above, we also cut chunks of artwork into gift tags. If we have a special occasion (recently, Dave’s Dad’s 60th birthday) we color specific things just for that occasion. 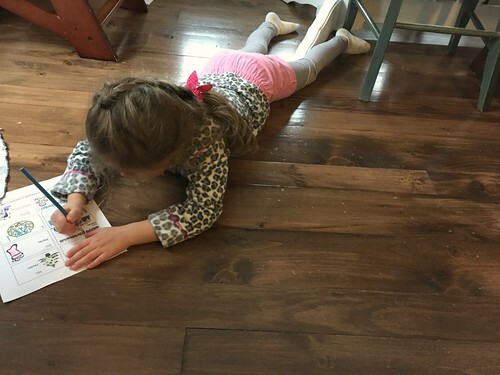 The kids LOVE this and think it’s so fun to color on the floor. I love that it never sticks around my own house! This might require a bit more planning, but we’ve done some fun calendars (both for ourselves and for grandparents) over the years. 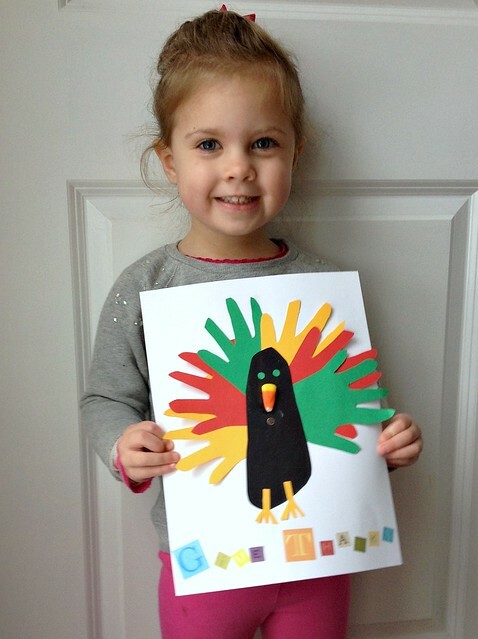 Sometimes I’ve done a special project (like last year’s hand-print / foot-print calendar) and other years I’ve just uploaded pictures of the kids with pictures of their artwork. Either way, I always wait until I get a free calendar (or BOGO) coupon from Shutterfly, Snapfish, or Minted, and then order my calendar. The shipping is only a few bucks so I often give the kids their own calendar to hang in their office under our stairs. They love flipping over to the new month, looking back at their own pictures and artwork, and coloring in the different boxes throughout the month. 7. 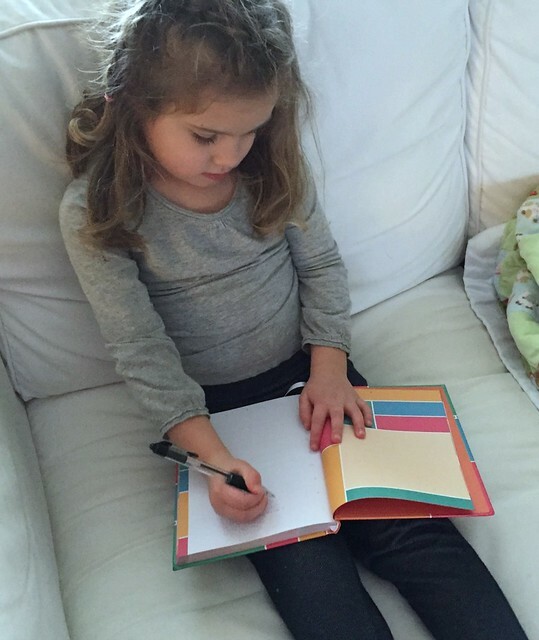 Create a book for the child. 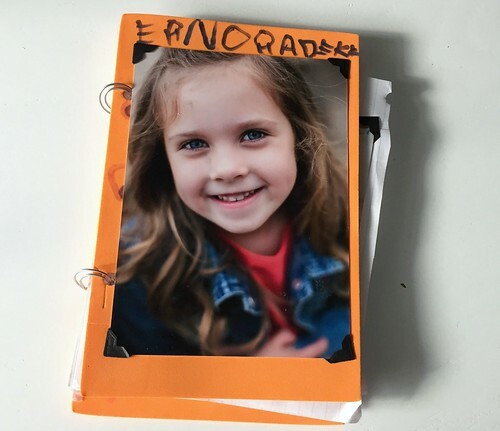 I’ve seen people make digital photo books for their children with JUST pictures of craft projects and artwork — but even if you don’t want to go the digital route, you could easily make a small paper “book” out of your kids artwork with very little time or effort. I did this for Nora’s 3-school papers last year. We only saved select items and put them in a binder with some pictures of her class, friends, mommy and me night, etc. 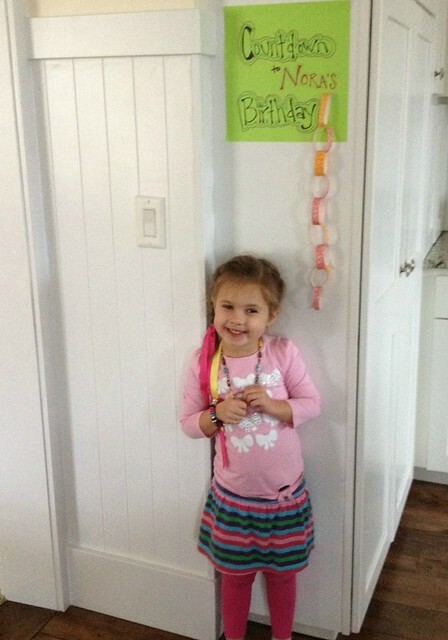 We also included special Thanksgiving, Christmas, and Valentine’s things she made, along with her “report card”. If you want to actually frame your kid’s artwork, they sell these really cool frames that allow you to easily swap in new drawings. I don’t use them yet (my kids really aren’t old enough for framed artwork) but these frames are on my “to buy someday” list for when our kids are a couple years older. 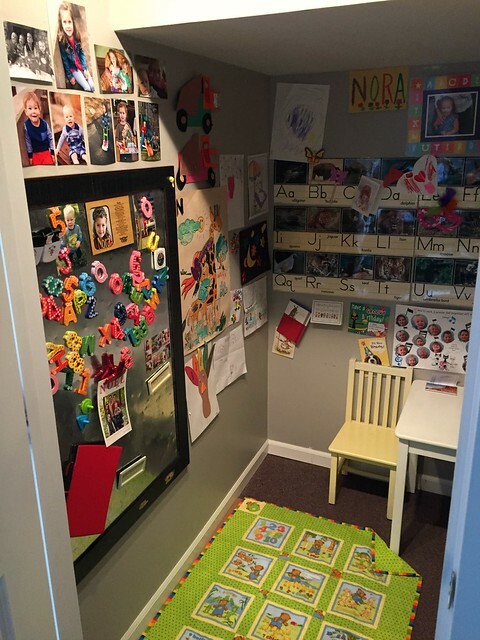 For now, we just hang their art in their “play office closet”, in their dress-up closet upstairs, or on the wall next to the refrigerator (our refrigerator is not magnetic). I always make it clear that even though we’re displaying this artwork NOW, it doesn’t mean we will display it forever. 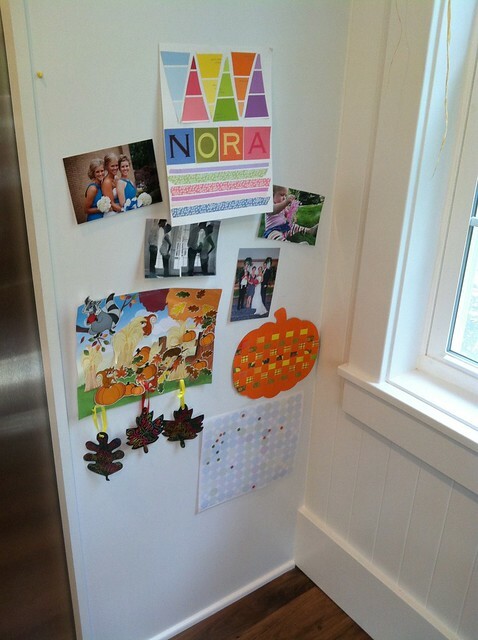 If Nora or Simon want to add more artwork to a space that’s already full, they know they need to first choose a few things to trash and then we’ll hang the new stuff. For example, I keep one drawing from each of them posted next to my desk. If they want to hang a different drawing next to my desk, it means I’m going to toss the old drawing. They usually put up a little stink, but give in rather quickly! Sometimes they even remove the old artwork before asking to put new things up! 9. Save it for seasonal decorations. We have a handful of holiday artwork items that we put away with our holiday decorations and break out the following year. 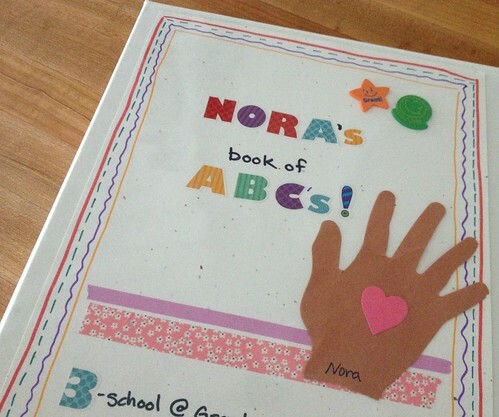 Nora also made a cute Nativity book at school last year and we store that with the Christmas decorations and read it after dinner during Advent. It might not be gone for good, but it’s at least out of sight for most of the year! 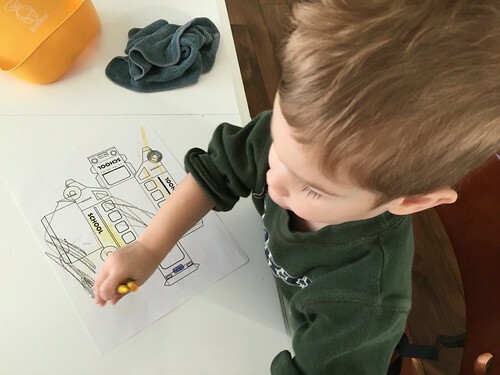 Seriously, there are only so many uses for kid’s artwork — and if your kids paint and color and draw as many pictures every single day as my kids do, there is no way you can possibly use it up fast enough. 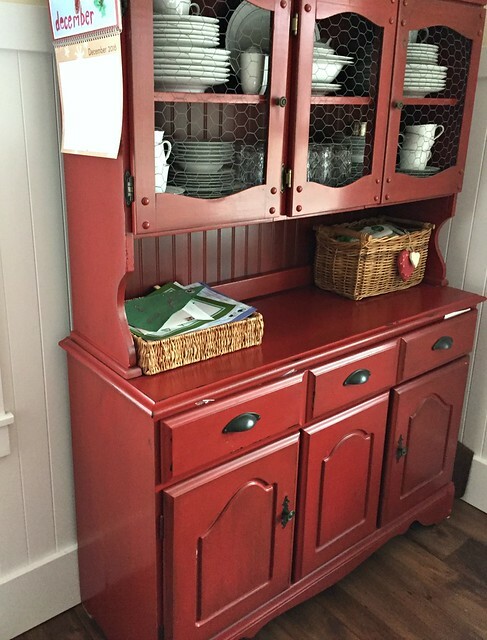 We keep a small paper-size basket on the top of our craft cabinet (see red cabinet below) and I put all their papers for the week in there. By the end of the week it is always overflowing (even after we’ve given several items away). On Saturday night, after they go to bed, I quickly go through that basket and pitch at least 60% – 80% of whatever is in there. I keep a few items we might want to display or give away… but everything else is tossed out. After a couple years of doing this every week, Nora has only ever asked me for ONE thing I threw out (and she remembers everything). I realize this might not work for older children who are more possessive of their things — but in my opinion, most children would keep EVERYTHING if we let them. So I reserve the right to make executive decisions about my kids’ artwork. Yes, I’ll let them pick what items they want to display. Yes, I’ll let them give specific items away to others. But if they haven’t asked about it in a week, I’m probably going to pitch it (especially if it’s just scribbles or something they didn’t put much time or effort into). 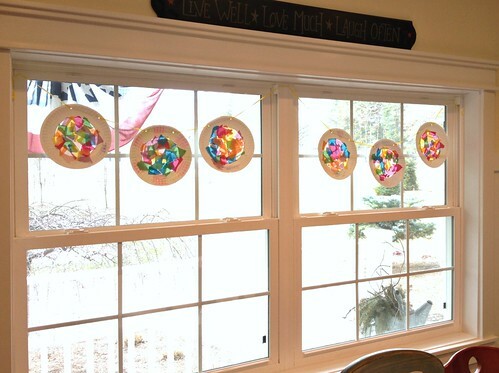 I’m sure there so many other fabulous ways to USE UP your child’s artwork — but these 10 ideas have worked well for us over the past 5 years. 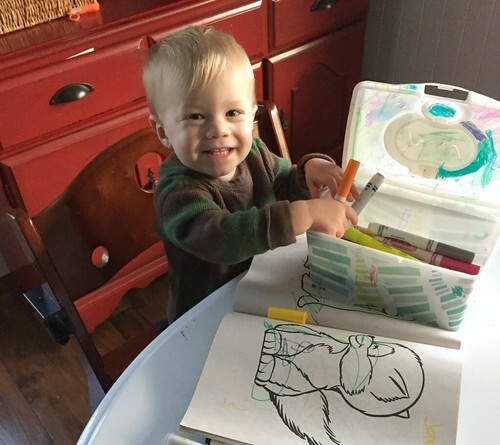 Our kids have so much fun coloring and painting to their little heart’s content… and we have very little (if any) kids “paper clutter” in our house as all the artwork is being used in some way — win-win! If you have other ideas, please share them in the comments! She said she’s old enough to “write like a grownup now” so she needs to make her “R’s” the right way. Dang school — why do they have to teach her all these uncute things! 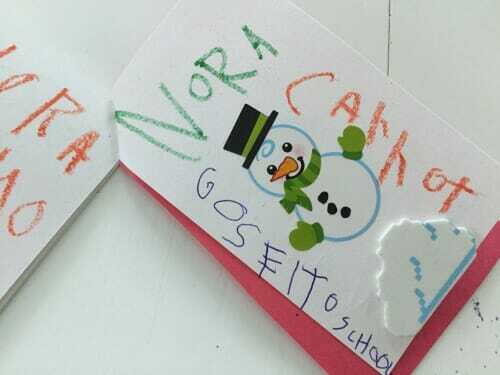 In case you’re wondering what she wrote in addition to her name… Carrot is the name of her snowman! 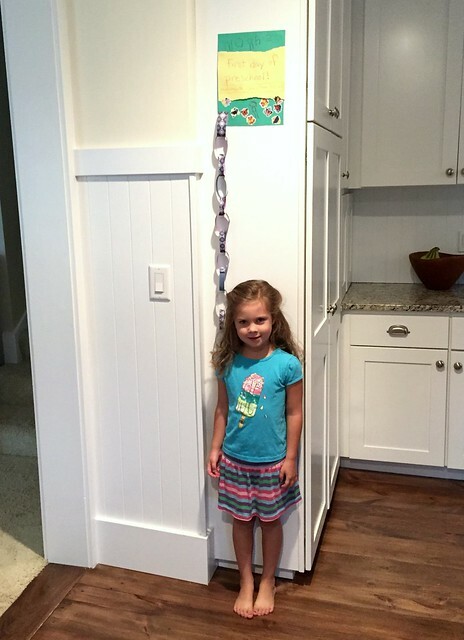 I love the countdown chain idea – I am going to use that. 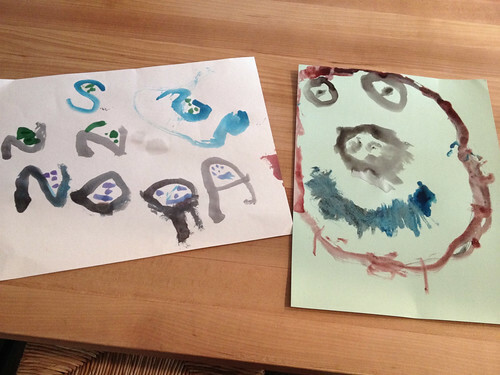 I hope I will make it a habit to mail them the kids artwork – and it can also double as a nice message board. (Let’s face it, I love it so much I will probably buy one for myself too). The fact that you say “pitch” to mean “throw away” is music to my ears! #Michigander #loveit When I worked at an office in FL, I asked my boss if it was okay if I pitched a few things. He said, “Wait a minute. Where are you from?” When I told him I was from Michigan, he said he thought so! I guess a few others from the office were also from MI and said the same thing. Apparently not everyone does! Love, love this post! I just really, really hope that this paper is getting put into the recycling chain and not into a landfill! If you don’t have home recycling in your area, please investigate how you can make this happen- since your husband works at a school, they should have a container that gets picked up regularly. Kids like the idea of the paper getting made back into paper that they can use for future art or that other kids who need paper can have! I take photos of most of it and pitch. I like your idea of taking a photo of the child with it, I usually just photograph the artwork itself. I do try to write down their name with age or date (like December 2016) and if they give any explanation I try to write it down, like labeling the parts of the picture, or who it was for or the context of making it. That makes the photo more interesting to me! Love some of these other ideas! Good idea to put some text on the photo — I might try that as well! yeah, I’m definitely not an artists, but I definiteliy don’t like paper clutter either! My poor mother saved so much and I literally tossed EVERY SINGLE THING when she gave me the box after Dave and I got married. I felt bad, but I had no desire to keep any of it. Even now, 10 years later, I have no regrets tossing it all. It’s just not my thing. I’m not sentimental, I don’t care about that stuff, and I’d rather enjoy empty space in my home! These are great ideas!! I have struggled with this issue a lot over the years. We do use some of these already, such as displaying the artwork or using it for holiday decor. Why did I not think of snapping a pic of the child with his or her work? I just snapped the work sometimes. That’s genius. There is an app called Keepy that I used for a while. They will store the pics for you. Shelly, thank you so much for sharing with Andrea the Keepy app. 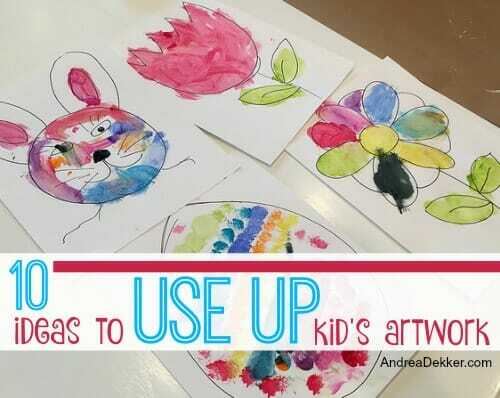 Andrea, what a great list of ideas for using our Kids’ artwork, would it be ok for me to share the blog with our app users? yes, feel free to share the link to my blog post, but please do not copy and paste my blog post content to your website (or anywhere else on the web). Thanks! I’ve been following your blog for a couple of years now, Andrea, and I love your ideas for saving money, space and decluttering, but I have to disagree with this ones. And I disagree because I was a very artistic child growing up. My parents saved every small piece of paper that I drew on and, yes, it did took too much space, but I’m eternally grateful. I had a plastic box were I would put everything I ever did and after many years of course I filled more than just that box, but As a child I would love to see the amount of drawing I did. My parents always encouraged me, they bought books about drawing, bought art supplies, found painting courses for me and would take me there every week and after I grew up I continued my passion in college. Today I only have two folders of my childhood drawings. One with my favorites and another one with the ones I like but are too big to scan (at least at home). But I decided to keep those drawing, I decided what to toss and purge, what to scan, what to keep and I can not thank my parents enough for giving me the opportunity to do that on my own. If your kids, specially Nora, are half as artitic as they seem, maybe it would be best to give each of them a box to keep their art work. Even making many drawing at week, it will still be a while before the box is full and when it is, they will purge it themselves, that’s what I used to do every since I was a small kid. I love to look back at drawings from when I was 3 years old and I love to look at how I ised to color them, how much paint I used and the textures. 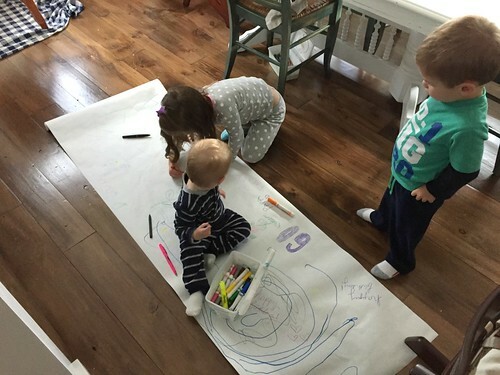 Think about how much they would enjoy a few (or many) years from now holding drawing from when they were five at their own hands. You don’t need to save everything, but I least let them decide what they want to keep it or not. They might decide to keep everything now, but that’s ok, they will let go eventually and be grateful that you saved their art. Thanks Paula! 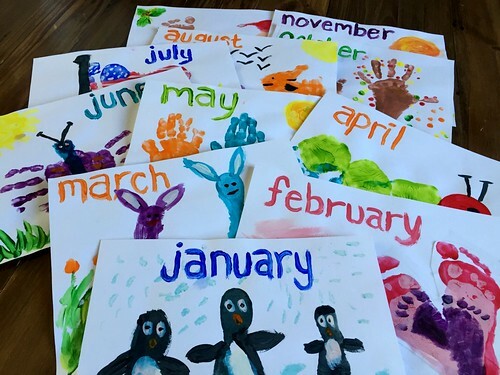 I certainly don’t expect everyone to agree with me, but since I get asked about children’s artwork ALLLLLL the time, I wanted to share some ideas that work for us. We too encourage Nora (and Simon and James) to be artistic, we just don’t feel we need to save everything they’ve ever done in order to encourage their artisticness. Love the countdown chains. 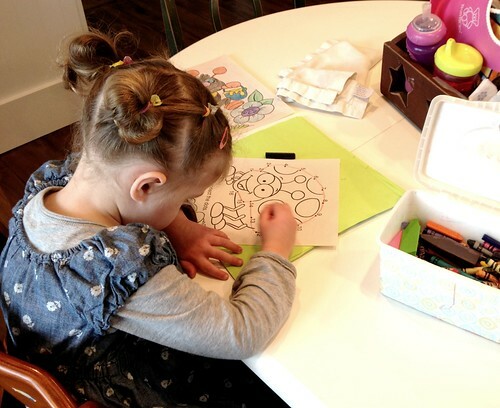 We occasionally used full-sized drawings or paintings as placemats. Use them once, enjoy, then discard. this is a great idea — thanks for sharing! Oh, I love the idea of mailing her art to others. That’s such a great way to think of older people who can’t get out much. I also love the calendar idea. The handprint calendar they did a while back was absolutely one of the cutest things I’ve ever seen. All of the ideas are good, but I especially like the idea for the rill of paper to make wrapping paper! That is fabulous! yes, we’ve used our “homemade wrapping paper” often! If it’s a hand or footprint or something finger painted I keep it. I laminate and put hole punch and keep in a binder. And yes, sometimes I look at it. But the rest I just toss. 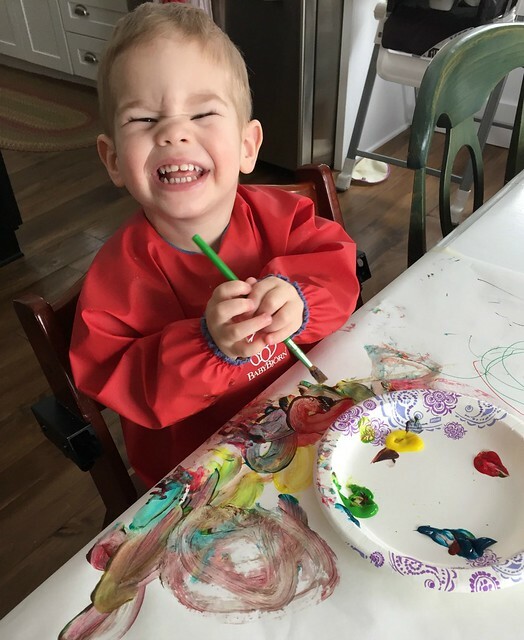 we don’t do much finger painting these days — it’s too messy for me with 3 kids! But I love that you have a system that works for you and allows you to toss it guilt-free! 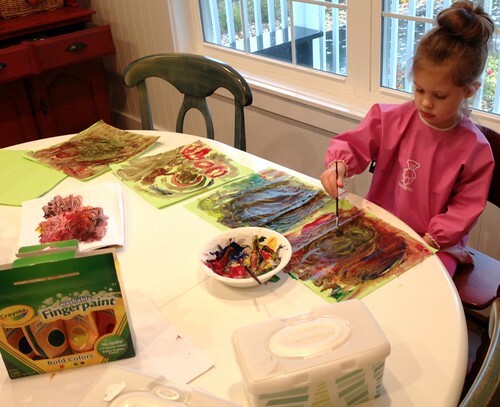 I am past the stage of kids’ artwork–and I pitched most of it, honestly. But I know there are several apps that can be used to “save” their “treasures”. Artkive is one of them! I wish there had been something like that when my kiddos were little! oh good, glad there’s someone else who just tossed the artwork too! So many of my friends and relatives act like I’m throwing away precious jewels when I toss the kids’ artwork. Honestly, I can’t keep it all! I can’t even keep 10% of of it without feeling like we’re drowning in paper clutter! Love the countdown chain. Awesome idea.